This week I have quite a lot of design work to catch up on and a few new projects with tight turns that will bleed into the weekend. I enjoy being busy and the challenges/limitations of many advertising/design projects are a nice balance for the complete (relative) freedom of making art, so it’s nice to be in that head space for a few days, actually. 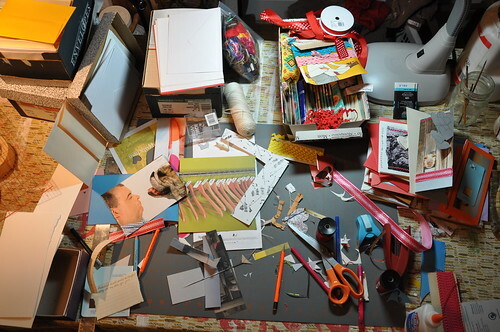 Of course, I can’t really share any of my work-for-hire design, so while my head is buried in photoshop files and logo sketches, here’s a picture of the chaos I created in the studio yesterday while wrapping the valentine project (life list #37: Make homemade valentines for all my friends and family one year) I started here. The valentines went into the post yesterday and I’ll share some pictures of them here on Monday. I did have a mishap with my sewing machine, it has to go to the shop for a tune-up, so I wasn’t able to do some of the stitching designs I wanted to. Still, I had loads of fun, anyway, and have really enjoyed spending time making unique cards and matching them to the personalities of the people I love.